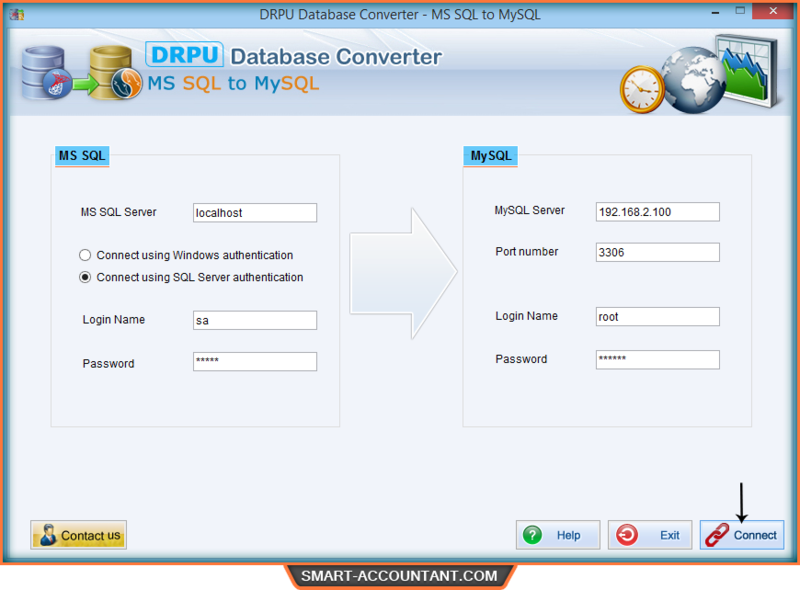 Introduction-MSSQL to MySQL Database Converter tool converts MSSQL database records into MySQL data base server. Database converter application tool converts entire database or selected records as per user choice. Database migration software provides option to convert table definitions, views as well as stored procedure. DB converter also facilitates users to skip converting of indexes. Software allows you to translate MSSQL database into MySQL database server with all necessary data type attributes and default values constraints (including unique and primary key constraints, null values and indexes). Database converter tool converts your data base even if user wants to overwrite converted database into existing MySQL database or provides option to save converted data at specified location. Database translator utility supports Unicode architecture and maintains database integrity. √ Convert entire or selected Microsoft SQL database records into MySQL database server as per your choice. √ Convert table definitions as well as views. √ Provides option to skip converting indexes. √ Support all necessary data type attributes such as indexes, primary key, null values and default value constraints. √ Support all major versions of MS SQL and MySQL database server.